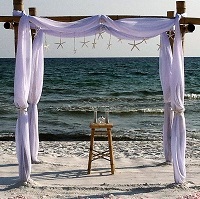 Upgrade your Basic Arbor Rental with this Sea Star Garland and White Chiffon Draped as Pictured. *This selection includes Sea Stars and Fabric only. Bamboo Arbor and additional décor pictured must be requested separately.